Always on. Always interacting. Always revealing interest. Your targets' online behavior can show exactly how to market to them. READ THE GUIDE THAT STARTED THE MODERN MARKETING REVOLUTION. Consider all those online activities your leads are doing every minute: website visits, white paper downloads, and email responses. Tracking this behavior can help companies quickly identify the buyers that are “raising their hands” to show interest in their solution. Get the guide and find out how. 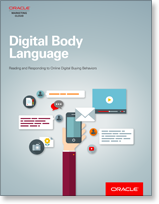 "Digital Body Language: Reading and Responding to your Prospects' Digital Buying Behavior"